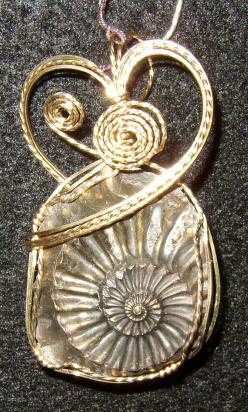 Wire wrapped pendant made from an Orthoceras fossil from Morocco and Sterling Silver wire. The approximate dimensions are : 1" W X 3" H X 1/2 " D and includes a cord. 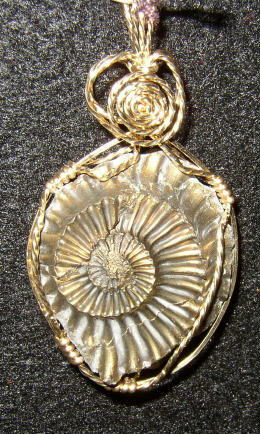 Wire wrapped pendant made from an Orthoceras fossil from Morocco and Sterling Silver wire. 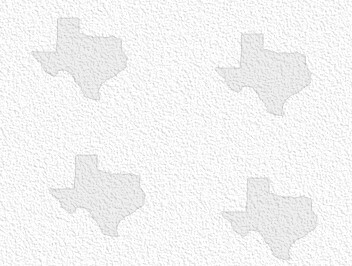 The approximate dimensions are : 1 1/2" W X 3" H X 1/2 " D and includes a cord. 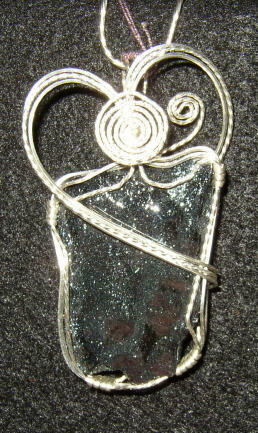 Wire wrapped pendant made from Specular Hematite from Michigan and Sterling Silver wire. The approximate dimensions are : 1 1/4" W X 3" H X 1/2 " D and includes a cord. 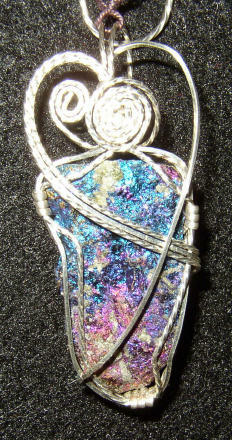 Wire wrapped pendant made from Peacock Ore From Arizona and Sterling Silver wire. The approximate dimensions are : 1" W X 3" H X 1/2 " D and includes a cord. 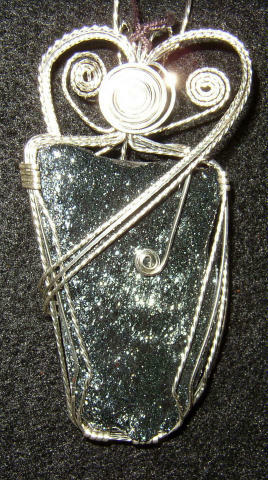 Wire wrapped pendant made from Specular Hematite from Michigan and Sterling Silver wire. 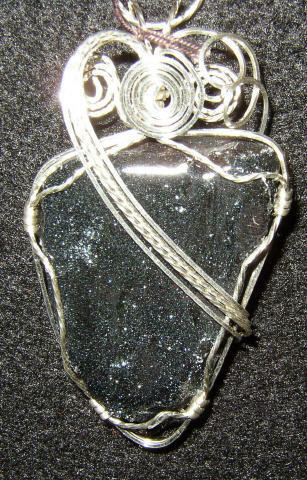 The approximate dimensions are : 1 1/4" W X 2 1/2" H X 1/2 " D and includes a cord. 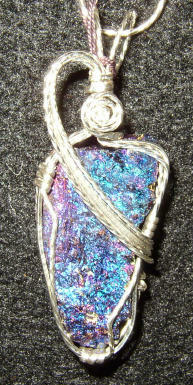 Wire wrapped pendant made from an Specular Hematite from Michigan and Sterling Silver wire. 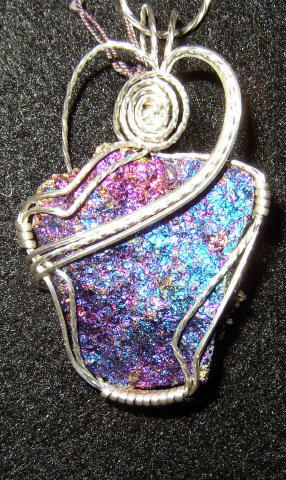 The approximate dimensions are : 1 1/2" W X2 1/2" H X 1/2 " D and includes a cord. 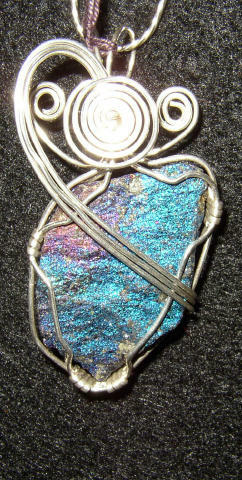 Wire wrapped pendant made from Peacock Ore from Arizona and Sterling Silver wire. The approximate dimensions are : 3/4" W X 2" H X 1/2 " D and includes a cord.